Eleven Fifty Academy is focused upon relevant, up to date fullstack coding coursework. Our strength originates in the diversity of our students and our passion is helping individuals create meaningful impact in their lives through finding their highest purpose. We are unique in that we are an inclusive school that boasts a 92% graduation rate with 81% placement at salaries averaging $51k with many graduates starting above $70k. Our graduates earn $1M in their first decade on the job. Eleven Fifty Academy consistently ranks as one of the Top Coding Bootcamps by Course Report. Realizing the need for a skilled tech workforce, Founder Scott A. Jones (voicemail, Gracenote, ChaCha) leveraged an optimal learning method that worked for him as a college student at Indiana University and as a research scientist at MIT: immersion. 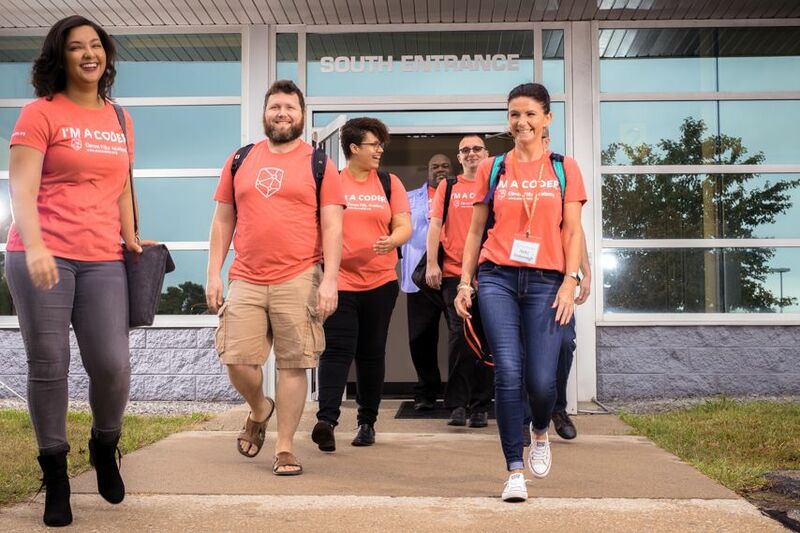 Our students come from diverse backgrounds and are interested in becoming a first-time coder, making a career change, or skilling up their current career as a software developer include technically-inclined veterans, women, and minorities. Eleven Fifty Academy has consistently been a strong supporter of veterans and thanks to a recent change to GI Bill benefits, Eleven Fifty is now able to help more of our military personnel transition to high paying jobs as software developers. With tuition and housing covered under their GI Bill benefits, veterans have a more immediate route to gaining financial traction after their military service. In addition to veterans, Eleven Fifty is a perfect solution for anyone with an aptitude for logic and problem-solving. As a nonprofit organization, Eleven Fifty Academy is focused upon people, not profit. We are data driven and are proud to be a member of The Council on Integrity of Results Reporting, or CIRR. CIRR serves as a 3rd party auditor. Their reported data is clear, simple, and validated. Only 10% of bootcamps choose to prioritize transparency reporting such as graduation rates, placement rates, and starting salaries. The intention of a bootcamp it to be intensive, focused, and results-driven. Compared to pursuing a degree from a traditional institution, requiring 4 years and over $80k in tuition resulting in an average of $30k in student debt with similar job prospects, the Eleven Fifty Academy experience provides a far more efficient path to gaining software development skills, resulting in a high pay, high growth job that is fun - with only a 12-week commitment. Eleven Fifty, alongside our partner employers, aggressively adapts our curriculum to match industry needs. We measure success by the placement and progression of our students. Through internship and apprenticeship programs, students gain real-world and hands-on experiences and are successfully positioned for future employment success. Our Career Services team’s job isn’t done until our graduates find theirs. Eleven Fifty Academy is more than a coding school; we help students discover and develop their strengths. At Eleven Fifty Academy, it’s not just about developing the coding skills. We work with our students to create developers with impressive soft skills that employers are looking for in their next employees and team members. Employer feedback data tells us that this is part of what sets our graduates apart. The Eleven Fifty Academy fullstack coding courses are designed to give students the experience and opportunity they need to start their coding journey. Regardless of their future, it all starts here at Eleven Fifty Academy.